Hubble Space Telescope continues to reveal various stunning and intricate treasures that reside within the nearby, intense star-forming region known as the Great Nebula in Orion. One such jewel is the bow shock around the very young star, LL Ori, featured in this Hubble Heritage image. Named for the crescent-shaped wave made by a ship as it moves through water, a bow shock can be created in space when two streams of gas collide. LL Ori emits a vigorous solar wind, a stream of charged particles moving rapidly outward from the star. Our own Sun has a less energetic version of this wind that is responsible for auroral displays on the Earth. 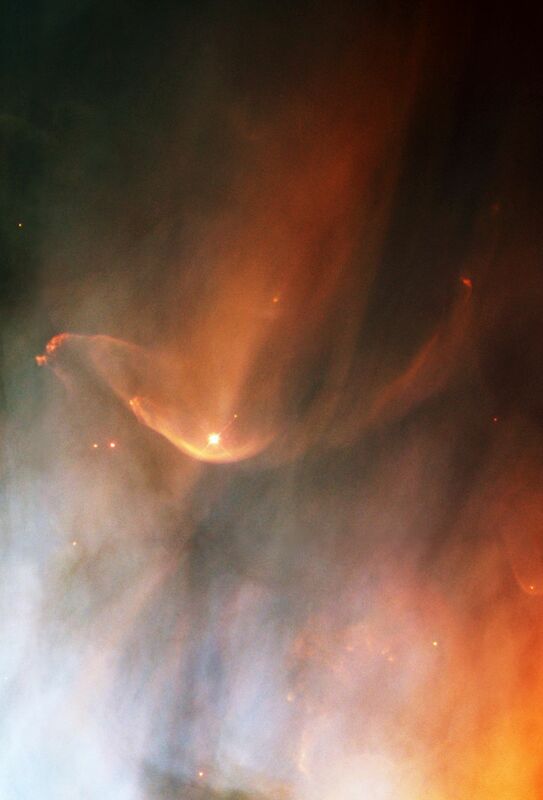 The material in the fast wind from LL Ori collides with slow-moving gas evaporating away from the center of the Orion Nebula, which is located to the lower right in this Heritage image. The surface where the two winds collide is the crescent-shaped bow shock seen in the image. Unlike a water wave made by a ship, this interstellar bow shock is a three-dimensional structure. The filamentary emission has a very distinct boundary on the side facing away from LL Ori, but is diffuse on the side closest to the star, a characteristic common to many bow shocks. A second, fainter bow shock can be seen around a star near the upper right-hand corner of the Heritage image. Astronomers have identified numerous shock fronts in this complex star-forming region and are using this data to understand the many complex phenomena associated with the birth of stars. This image was taken in February 1995 as part of the Hubble Orion Nebula mosaic. A close visitor in our Milky Way galaxy, the nebula is only 1,500 light-years from Earth. 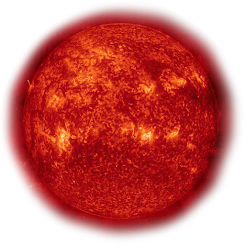 The filters used in this color composite represent oxygen, nitrogen, and hydrogen emissions.